Bargain Shopping Paradise: Don't forget . . . tomorrow is "Bargain Brag Wednesday"
Don't forget . 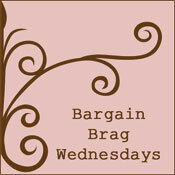 . . tomorrow is "Bargain Brag Wednesday"
Mark it on your calendars! Every week, I feature frugal projects on "Bargain Brag Wednesday." If you have a fun, budget-friendly bargain shopping find, thrift store outfit deal, DIY project, side-of-the-road pick-up, consignment shop steal—ANYTHING you've done that's saved your money—don't forget to link up tomorrow. It opens at 6 AM, and stays up all week long. Next Wednesday, I'll feature a project from this week's link up, and it could be yours! So, grab the button and get blogging about your fabulously creative and frugally-conscious ideas. Then, come back here and link up tomorrow, April 7th! Brag about your bargains tomorrow! Share your money-saving ideas tomorrow morning! My background is back! Woo-hoo! Kroger's Design a Reusable Shopping Bag Contest! DEAL ALERT: Snapfish birthday party! Help! Trying to get my background working right!